North side property line in back garden ~~~ Gama grass, Tripsacum dactyloides (45 border the top backside of the berm), Ligustrum sinensis 'Variegata' (middle of photo~ 7 plants), Feijoa sellowiana, Pineapple Guava (3 behind Gama) and Trachelospermum jasminoides, confederate jasmine covering the entire fence in the background. Each one cold and winter hardy showing no signs of stress in winter or summer. Not only has it been my goal to choose plants that uphold good characteristics in summer as well as in winter but there's another thread that runs through each of my designs and ideas for this garden. North side property line in back garden also. 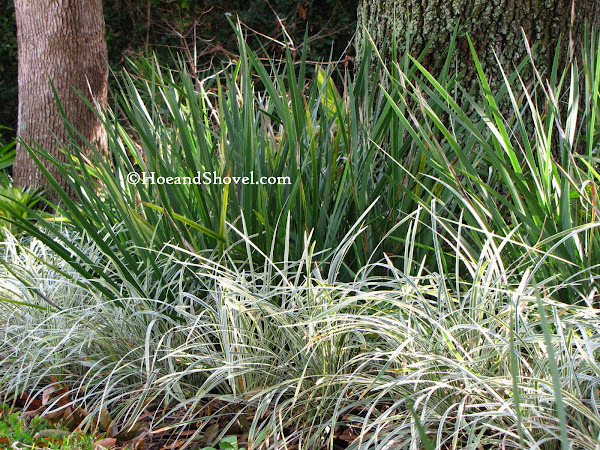 Variegated aztec grass and African Iris are visible here. Many varieties of cold hardy plants in this planting bed make good neighbors. Cyrtomium Falcatum, Holly Fern has long been a favorite for a slow growing textural plant that does beautifully in filtered or dappled sunlight and isn't bothered by summer heat or winter frost. Not a native but highly considered Florida-Friendly. In the last few years the trend has been a purposeful evolution. One that moves my garden toward a more naturalistic appearance. It might be described as tidy edges with delineated spaces but with sort of an arranged wilder-side. All the while catering to the environment; recognizing my role as a steward of my little eco-system. This approach is bringing me closer to achieving a look and feel that defines and distinguishes my Florida garden as not only sustainable through all seasons but I find that it increasingly blends with and represents better my distinct gardening personality. In stubborn determination I'm resisting the urge to panic when the forecast calls for freezing temperatures. I'm growing dull to the dreaded announcements. I'll never get used to it or like it but I decline the inclination to spend countless hours building structures (like I've done so many times in past years) to cover every tender-to-cold plant with make-shift tents of freeze cloth. In so many instances these efforts are worthless and don't do that much good against the type of frosty cooling we've had the last few years. 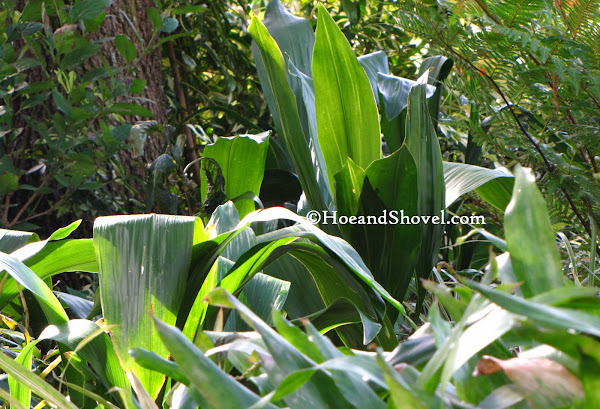 The old-fashioned Aspidistra elatior, cast iron plants are just that. Like cast iron their upright leathery leaves in mostly tree-filtered light are a fabulous summer and winter evergreen plant. Meanwhile making close observation of the steadfast and hardy plants suited for this climate through all seasons is duly noted. Each planting area is being observed with renewed vision. By division, additional purchases, root cuttings or pass-alongs the criteria for the vast majority of plants acquired in this garden is based on durability, low maintenance, wildlife appeal, drought resistance, and cold hardiness. They are and will be the foundational cornerstone of each setting. The goal is that Old Man Winter will no longer "take out" my garden completely when he decides to visit either on a fluke in early December or stays for a long duration like last winter 2010. There is more. Another post entry is forth coming to highlight more cold hardy/summer hardy varieties at Hoe and Shovel. 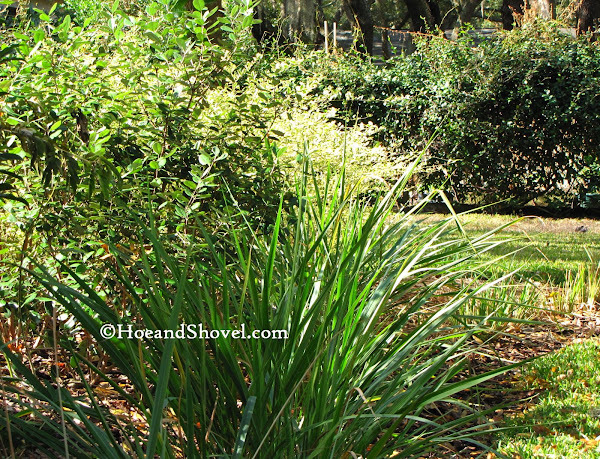 a typical 'tropicalesque' Florida garden vs. a freeze damaged Florida winter garden are notably quite different. unlike our northern neighbors, we do not lose all, buried in snow or ice, but the resulting 'burnt' look is not at all attractive! these last two posts are most helpful (especially the pics)- they inform us how to make the best of our weather fluctuations with plantings that at best preserve some semblance of an attractive garden year round. very good info, thanks! Aren't you the clever one? I agree. Why try to beat Mr. Freeze every season? It's not going to get any better over time. Love your peaceful transition. It suits you. I've seen the chinese fan growing in very shady spots. 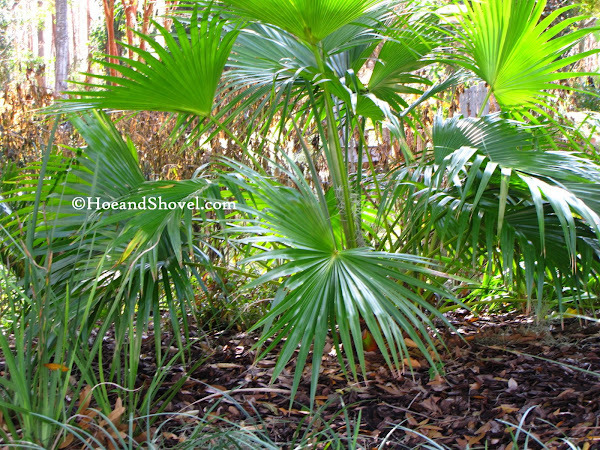 It keeps them kind of nice and low-growing more like a shinier palmetto. I've also seen them growing in full sun... right next to the Interstate. Mine is in filtered light. I'm going to add more in troubled spots in the spring. Floridians do not ever get used to seeing our plants burned to the ground. It is just not something we grew up with except on occasion. These days it is happening way too frequently. I'm going with peace. Which is decidedly different for each individual. For me, it is not fighting with the elements but going with them as much as I am able.Thanks. I was wondering, Meems, if you ever get Pineapple guava from your bushes. I've got one planted and my climate isn't really conducive but I wonder if yours is. Great post! So encouraging and enjoyable to read your blog Meems! Today I took some notes-you are a true teacher and I learn from you all the time! Thank you for sharing your gardening insight, discipline, creative mind and so much more. Another thought.... My "Swallow Tail" plant looks dead. In your experience, do you think it might recover? It is planted in the ground on the East side, received sufficient water, but has slowly declined even before the cold. I am so dismayed by tomorrow night's forecast, that I could just cry. Fortunately, or perhaps unfortunately, the mind is distracted by other life events right now. The only thing is, portions of the St. Augustine lawn that had been browned have actually been greening up this past week, only to have another freeze coming. Ugh. Thank goodness we have so many hardy staples to choose from. 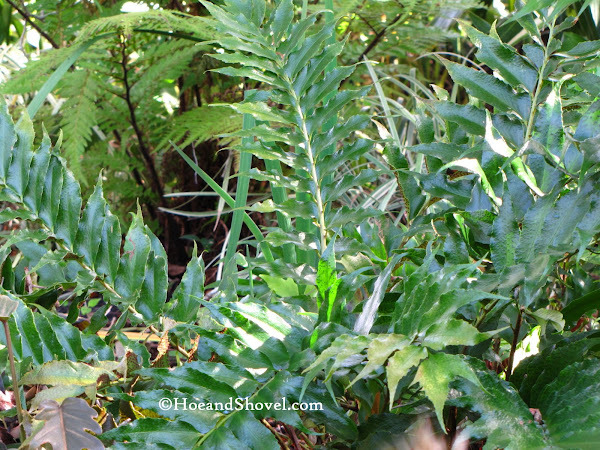 Holly fern is one of my favorites...i love that it clumps instead of spreading wildly...nice dark green color, too. I just wish we had some colorful cold-hardy foliage plants. You're smart to establish a solid foundation of cold-hardy plants. I planted three pineapple guava last spring. I was happy to get blooms but never noticed any fruit. I'll pay closer attention this year as they are more mature. Definitely not a 'tree-hugger' sort but I adhere to the principles of each person doing our best to contributing to preserving our natural resources. I'm so enjoying the rewards of it here in my little corner of the earth. Usually the lawn recovers just fine once spring rolls around and warmth is once again the norm. Tomorrow night's predictions will be a close call I think. I hope all is well with you and your garden. Hmm. 14degrees out there. Maybe it is time to move south.